Form Builder enables businesses to survey their users, create and grow mailing lists or collect new sales leads. This tool is customizable and edits can be made from a webpage. 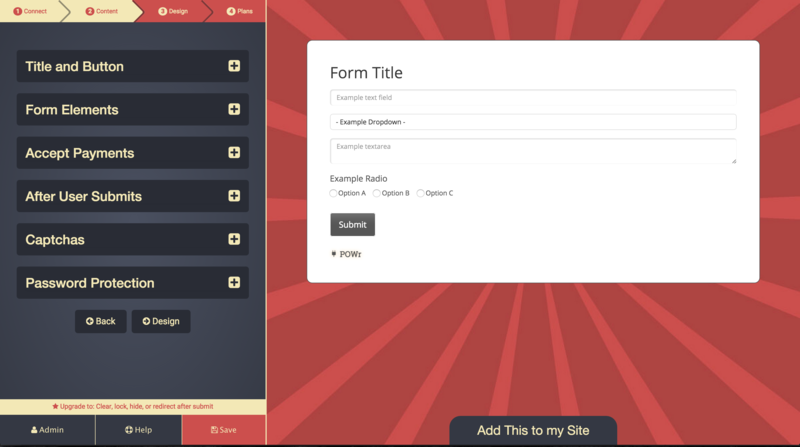 Has featureAdd up to 20 form inputs. Has featureInputs for text, dropdowns, checkboxes, email, date, and more. Has featureExpert templates or complete customization. Has featureCustom fonts, colors, borders, backgrounds, and ‘thank you’ message. Has featureReceive automatic email/text notifications. Has featureAccept payments through PayPal. Has featureCreate recurring payments for subscriptions and memberships. Has featureAutomatically store response data for analysis and export. Has featureOptional vs. required input fields. Has featureBuilt-in support for text in any language. Has featureMobile responive design looks great on any device. Has featureAllow users to submit files directly through forms. Has featureStatistics for traffic and page views.